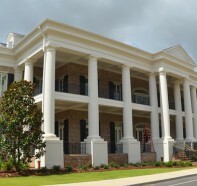 We manufacture and distribute 2 types of fiberglass columns. Both come with a limited lifetime warranty but offer certain advantages over one other. Fiber Reinforced Polymer (FRP) is most advantages when column covers are required. The product is lightweight and comes standard in 2 halves with internal lap joints to facilitate quick reassembly around structural members. 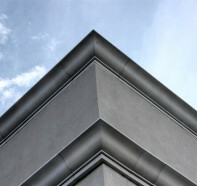 Architectural Augmentations manufactures exterior fiberglass “FRP” entablature components: Cornice, Frieze, and Architrave to complement our architectural column line. Our moldings emulate the old world architecture of the Greeks using modern composite materials that last a lifetime. We have many standard profiles to choose from but our in-house mold making capabilities allow for custom profiles to be comparable in price. We have been manufacturing exterior composite balustrade systems for over 20 years. Our balustrades, manufactured using a rotational cast method, are made from a resinous marble matrix that is reinforced with fiberglass strand. FRP is the same material that most modern boat hulls are made from so you can expect the same weather resistance and strength from our architectural products. We prefinish each piece with marine grade gel coat and then back it with fiberglass reinforced polyester resin that results in a lightweight product that is stronger than steel. Our cast offering is a poly marble composite product made with marble filler that is reinforced with polyester resin and chop strand. Unlike the paper pushers who claim to be manufacturers, we have an intimate connection with our products because we made them, sold them, and installed them. You can never truly know a manufactured product unless you have experience installing it because the real nuances are found and ironed out at that level. 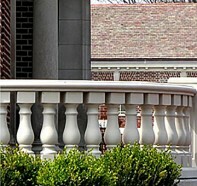 All of our columns, balustrades, entablatures, cornices, domes, door and window surrounds, pediments, brackets, wall panels and façade elements are made from fiberglass reinforced polymers or FRP. Our products adorn everything from personal residences to grocery store chains to government buildings. We have hundreds of standard profiles to choose from but, due to our in-house mold making capabilities, customization is encouraged. In fact every standard item that we offer was at one point custom. Our ability to make our own tooling allows for custom products to be fairly inexpensive. If you have a historic restoration project or just envisioned something beautiful and want to bring it to life, let us know and we will make it a reality. 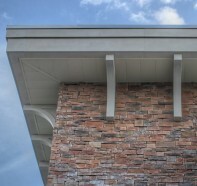 It is our passion to memorialize old world architecture using composite products that will last. We offer cad drawings, specifications, and design assistance to the design professional. If you can’t find it on our website, please call or email. We look forward to working with you on your current and future projects requiring architectural fiberglass products.